The State of Kansas is requiring students to pay a greater share of higher education costs than ever before. 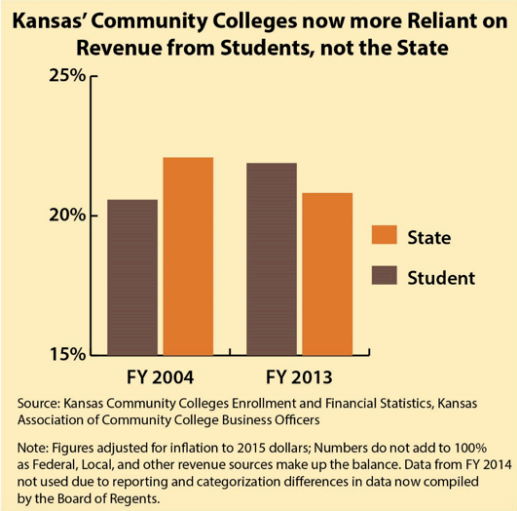 According to the nonprofit, nonpartisan Kansas Center for Economic Growth, higher education in Kansas is in trouble. The report found state funding for regents universities is 17 percent less than it was in 2008. Community colleges are also receiving less funding, which puts a higher cost burden on students at those schools. In an e-mail to KMUW, Nathan Madden, with the Kansas Center for Economic Growth, said that when educational costs rise, the opportunities an education provides can become out of reach for the kids who most need that chance to succeed. Madden said the state’s chance of having a well-educated workforce has been put into jeopardy by misguided tax policy. Researchers say 65 percent of Kansas college graduates left school with loan debt in 2014, compared to 57 percent a decade ago. They also leave with more debt: $25,000 on average, a 63 percent increase since 2004.